People, who like beer, will love the Multipack | gift by the Thimm Group. The single-material solution made of corrugated cardboard that won a Promotional Gift Award 2018 in the category Custom-made Designs is an innovative gift set and original packaging for bottles in one. As a six-pack of a slightly different kind, the well-thought out all-inclusive construction offers not only enough room for six bottles of Munich beer festival beer, it also contains the matching tankard, which at the same time serves as a handle for the fantastic ensemble. So, the safe transport and immediate enjoyment is guaranteed and what’s more the appropriate coasters are also included in the distinguished beer box. 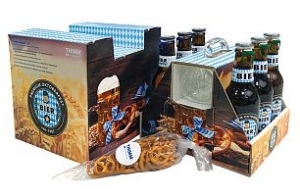 Whether for a POS promotion, trade fair appearance, anniversary campaign or prize draw – the Multipack | gift can be individually adapted to suit the customer’s requirements and offers breweries, beverage manufacturers and restaurants for instance plenty of room for brand communication and storytelling. Motifs and advertising messages can be applied to the item as a 360 degree print.